Sitting More in the Wintertime? Sitting is the new smoking. Okay, maybe that’s an extreme example but it’s starting to look like it. The amount of time you sit per day is a new marker for health and longevity. Studies show that sitting all day leads to poor heart health, issues with diabetes and cancer and even increased risk of early death. So maybe sitting is the new smoking. Putting aside all of the negative health benefits sitting does to your body in general, what does it do to your hips? Shortens and/or weakens your hip flexors. “Turns off” the muscles in the back of your body, like the glutes and hamstrings. Creates muscle asymmetries if you sit the same way all of the time. Forms disproportionate muscles in the upper and/or lower body (think hunching of shoulders and/or arch at the low back). 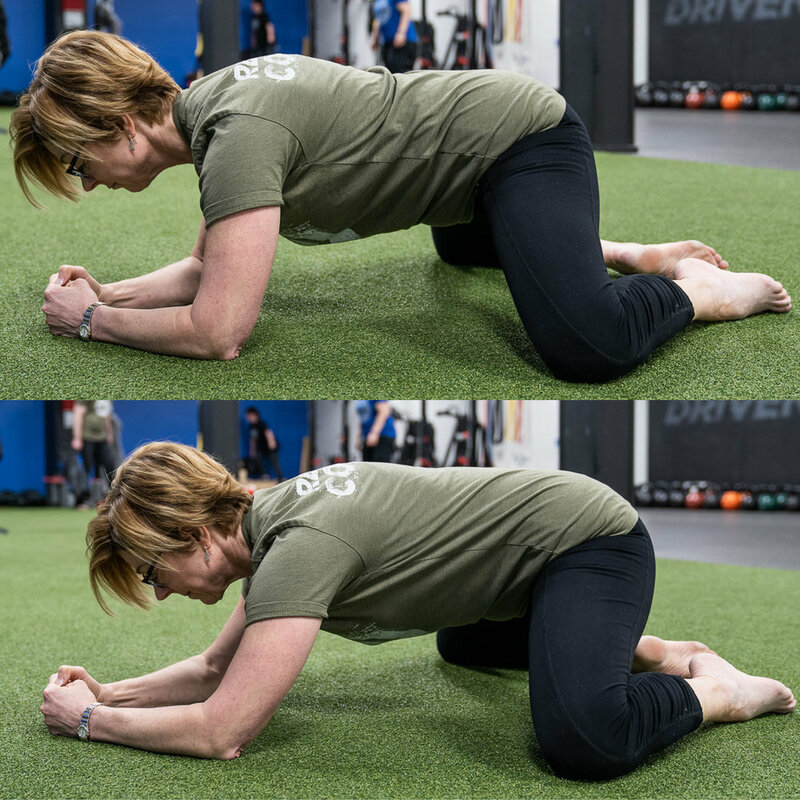 Start with one knee up and one knee down, your hands on the up knee and the toes dug in on the back foot. Start to create tension through the floor. Meaning, push the ground away hard. Then drive yourself forward to feel a stretch in the front of your down leg thigh/hip flexor area. If you don’t feel this stretch, try pulling your belly button up toward your face and try again! Drive the knees down and apart while you rock back toward the feet. As you rock forward, keep pushing the ground away and drive the knees apart and into the floor. Start with your knees bent and feet out in front of you. Rock both knees over to one side. Adjust your legs so that the instep of the front foot is touching the opposite knee. Place both hands on either side of the front knee. Get a deep belly breath and when ready walk both of your hands toward the back hip. Actively push the ground away to stay tall. You now have a few moves to try out. Keys to each one are finding appropriate breath and tension. If you find yourself holding your breath while increasing tension or after rotation, back out of the movement until you gain your belly breath back again. You shouldn’t feel any pain in the neck, low back or knees.